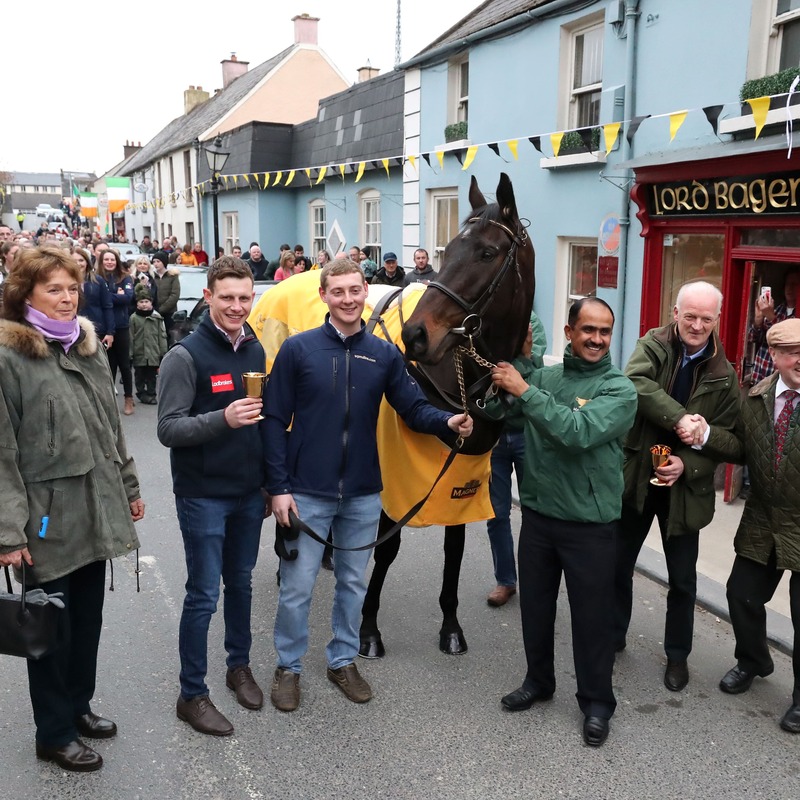 Al Boum Photo was given a hero’s welcome as the Magners Cheltenham Gold Cup winner paraded through the village of Leighlinbridge on Monday evening. Having saddled the runner-up on no less than six occasions, Willie Mullins – the winning-most trainer in Festival history – finally got his hands on the most prestigious prize in the sport when Al Boum Photo galloped up the hill in front in the hands of Paul Townend. Mullins was emulating his father, Paddy, who claimed Gold Cup glory with the mighty Dawn Run 33 years ago. With the celebrations having gone on for several days, the traditional homecoming parade in County Carlow was delayed until 10 days after the race. But the locals finally got their chance to see Al Boum Photo in the flesh, with around 500 people in attendance as the Joe and Marie Donnelly-owned seven-year-old – with Mullins and Townend in tow – received the acclaim of the crowd. Mullins said: “A lot of people made the time and effort to come out. We’re very pleased because I didn’t know if two or two hundred would turn up. We got a great turn out in the end and hopefully we’ll be back next year! “It’s good to see the local interest. It’s very good to have the local community coming out. Al Boum Photo was a little sharper than I thought he would be because he’s normally very laid-back. “I’d like to bring him back to Punchestown (Punchestown Gold Cup), that’s my goal, and it’s a nice break between Cheltenham and Punchestown. Al Boum Photo was one of four Mullins-trained runners in this year’s Gold Cup – but was the only one still in contention with over a circuit to run. He went on: “I had resigned myself to having another disappointing year in the Gold Cup, but thankfully Paul and Al Boum Photo came good. “I couldn’t believe it as I was watching it unfold, how they were jumping and so relaxed. They were just a unit moving along nicely behind the pace. “I thought if everything goes well they’ll have a chance and then it opened up turning for home and Paul just did the business and gave him a squeeze. “What I like about him is that he’s so young and we have a lot to look forward to, but even if nothing else happens he’s done what we could never do before. Townend – who looks likely to be crowned Ireland’s champion National Hunt jockey for the second time this season – was heavily criticised after mistakenly bypassing the final fence aboard Al Boum Photo when looking set to land a Grade One prize at Punchestown last April. For him, the Gold Cup triumph was a moment of redemption – and he admitted the victory is still sinking in. Townend said: “It’s great to see everyone here and especially so many kids. It’s a real local success and it feels special. It’s every bit as good, if not better, than I imagined. “We’ve seen both extremes on this horse and that’s probably half the reason I lost the run of myself crossing the line and embarrassed myself a little bit. He added: “I couldn’t believe how straightforward it went for me. I saw Kemboy (stablemate) falling, out of the corner of my eye, early on and noticed Ruby (Walsh, on Bellshill, another stablemate) wasn’t jumping down the back. “Patrick (Mullins, aboard the stable’s fourth runner, the ill-fated Invitation Only) was in front of me and when he fell I was probably lucky enough not to get brought down by him. “I hadn’t realised Ruby had pulled up by that stage, but I can only ride my horse and I was in such a brilliant rhythm going out the second time. “He was jumping from fence to fence and taking a blow when he needed it. I was in the position I wanted to be without having to ask the horse anything. “I probably committed a bit sooner than ideal, but just by bypassing the third-last it caused a bit of commotion going into the bend. I had the horse to get in there and was able to sit when I got into the gap. “He pricked his ears down to the second-last and the last. I got a couple of smacks into him and he picked up and galloped to the top of the hill for me. “We had a good start to the week, it let us settle into the week, but come Friday, Tuesday seemed a long time ago.